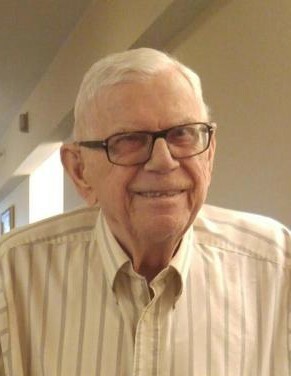 Harold B. Vinson, 89 of Glen Burnie passed away on April 12, 2019. Harold was born on June 19, 1929 in Baltimore to the late John and Willard Vinson. Harold was a graduate of Glen Burnie High School and served in US Army Air Corp and Air Force. He was an active member of Glen Burnie United Methodist Church. Harold retired as General Manager from Singleton Funeral Home after many years of service. He enjoyed golf, spending time with his family and going to Bethany Beach, Delaware. Harold is survived by his beloved wife, Beverly A. Vinson; his two daughters, Constance A. Long (Tod) and Nancy L. Jones (Tim); his grandchildren, Heather Womick (Bryan), Tony McIntyre, Beth Hernandez (Marco) and Kerry Denbow; and his great-grandchildren, Ashley, Aidan, Cameron and Mason. A Memorial Service will be held at Glen Burnie United Methodist Church, 5 2nd Avenue SE, Glen Burnie, MD 21061 on Thursday, April 18th at 11 AM. Interment Glen Haven Memorial Park. In lieu of flowers contributions may be made to Glen Burnie United Methodist Church, 5 2nd Avenue SE, Glen Burnie, MD 21061 or to the SPCA.